Let’s face it—sometimes you have the solution to a business problem, but your management just won’t listen. Perhaps, you’re using spreadsheets to keep track of your customer-related data and realize that it’s no longer the best solution for your growing business. You know that CRM software is the solution. But unless you build a solid business case, your superiors may not approve of the investment. 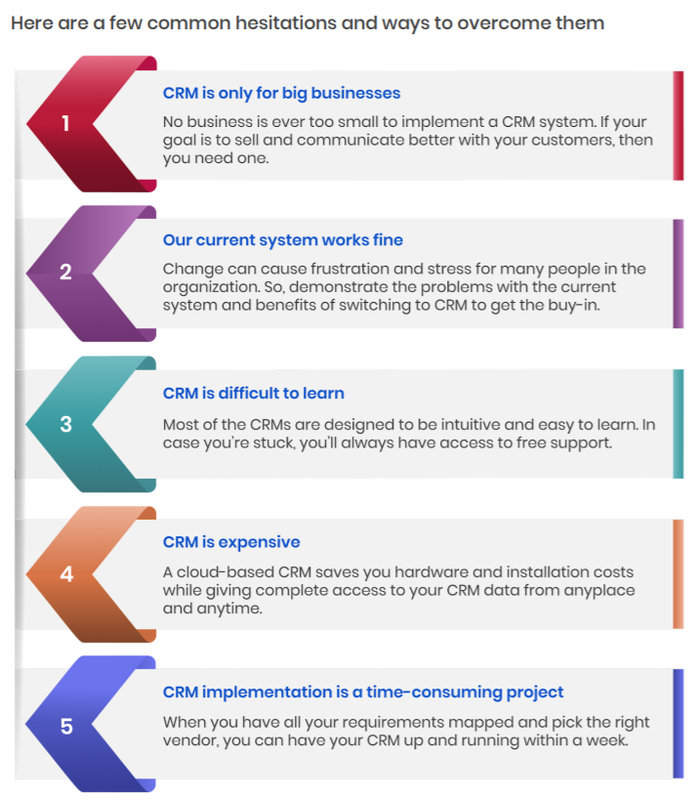 So, follow these steps to come up with a compelling business case to purchase a CRM. The goal of this step is to come up with specific problem statements that need to be addressed because it is preventing your business growth. These problem statements form the base of your reason for making this case. To get started, answer the following set of questions. If your answer to any of these questions is a NO, then that’s the problem you want to solve. Do you see deal details, right from your email client, when responding to an email from a prospect? Do you have a group mailbox to collaborate easily with other members of your team for company mailboxes such as sales@abcorp.com? Do you let your clients pick meeting times easily by sharing your calendar and without having to play phone tag? Are you able to get signatures for your documents in minutes without having to print and courier them? Do you get real-time updates whenever an important event happens with your customers? Do you get alerts when a contact goes idle for more than a certain period? Can you set reminders to follow-up on out-of-office notifications? Do you know when it is time to grow your sales team because the funnel is overflowing? Can you generate pivot reports on your data easily? Do you have one chart that displays your team’s funnel, opportunity amount, and opportunities at risk? Do you know how many sales you lost last quarter and why? Do you know which sales reps are performing above and below expectations? Are you able to list all the deals that went inactive in the previous week? Can you quickly track a sales rep’s activities for specific customers and/or prospects? If one of your sales reps left your company tomorrow, would you have all the information of the customers that they were working on? Can you quickly segment your leads with similar characteristics to send targeted messages? Can you set up drip campaigns that allow you to nurture high value leads through different sequences based on behavior? Can you score your leads based on who they are and how they engage with you? Does your lead scoring also take into account the engagement level of your prospect across email, chat, phone, and website channels? Do you get an alert when a prospect mentions your brand on any social channel? Can you automatically capture leads from your website into your CRM? Most represented among your leads? Have the highest chance of buying from you? Purchase the most from you? Can you segment your leads and customers to send them targeted campaigns? Do you know which of your marketing campaigns earned the highest engagement and conversion? 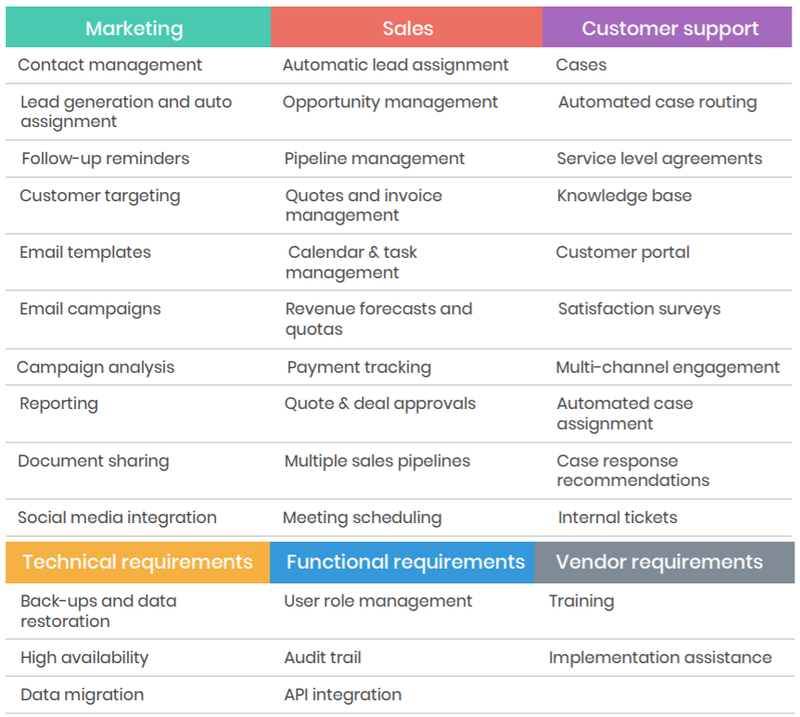 Is it easy for marketing to hand leads off to the sales team when they’re sales-ready? Can you send out surveys to get feedback such as NPS? Do you have a way to hand lead information to sales besides email or hard-copy? Can you see recent chat, cases, calls when reviewing a case, without having to click or go elsewhere? Do you have a system that provides recommendations to speed up responses? Can you send canned responses for frequently asked questions in 1-click? Do you have customers’ complete purchase history to answer their queries? After a case resolution, can you automatically request customer feedback? Are the customer requests being routed to the right agent? Can you quickly escalate high priority queries to ensure fast resolution? Do you know how many customer service issues each of your customers have had in the past? Do you know how many cases each of your team members is resolving every day? Can you quickly identify process bottlenecks? Do you have a process in place to ensure SLA compliance? Is there cross-team visibility into information for each contact or deal including notes, telephone calls, and scheduled tasks? The parts of business affected by the problem. Eg: team productivity, customer experience, team collaboration. Sample problem statement: Our sales team spends several our entering and updating data on spreadsheets to manage sales activities. When these updates aren’t done in real time or when records are updated accidentally, sales reps work with incomplete or incorrect customer data. This process is inefficient and annoys prospects. Have each CRM user rank and prioritize the list of requirements based on their specific needs. Once all team members have submitted their requirements rankings, summarize the findings. There are 3 core cost components to consider when looking at your CRM budget: software cost, support cost, and configuration and customization cost. Software cost: The cost of the software is the easiest bit to budget as it is mostly static. CRM software is usually priced on a fixed monthly or annual price. You’ll also find several plans which cater to the needs of small, medium and large businesses. Support cost: User training, implementation support, local partner support, and consultation charges are a few costs to keep in mind for this. Configuration and customization cost: The biggest problem with CRM projects is requirement creep. CRM systems help solve business needs for a company, but business operates in a dynamic environment — there are continual changes in the operating environment that affect business processes and decisions. So, the costs may rise as your configuration and customization requirements change. Along with these core costs, a soft cost that needs to be considered is the impact on employee productivity during the implementation stages. A full-fledged CRM implementation period could range from a few days to several months depending on resource availability and system complexity. There may always be hesitations around investing in new technology and going through the process of change. Fun fact: According to a study by Nucleus Research, every dollar spent on CRM implementation returns as much as $8.71 in sales revenue. A return on investment in purely financial terms has a precise definition. It is merely a comparison of what was invested, against what was gained on the investment. However, since CRM results involve a few non-financial gains as well, accurate ROI calculation could be tricky. Return on a CRM software investment can be difficult to quantify initially, but the increased sales, enhanced employee productivity, improved customer retention, and reduced operating expenses over the long run will undoubtedly be worth the cost. Use all the data gathered to create a compelling business case and present the recommendation to the management board to get approval to proceed. Use the above steps to get your management on board with CRM and you’ll be on your way to crafting better customer relationships in no time. In case you’re looking for an easy to use and customizable CRM for your marketing, sales, and customer service teams, search no more! Try Vtiger today to unlock explosive growth.